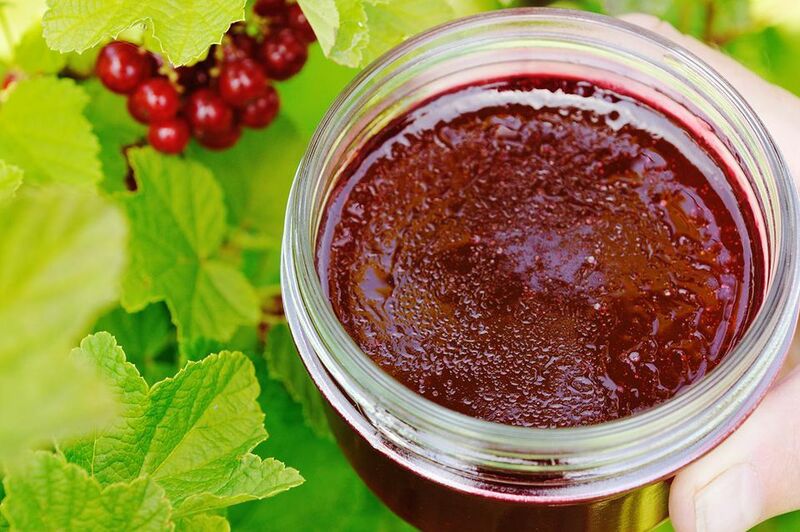 Currants naturally possess a perfect combination of pectin and acidity, which ensures a good jell without the need to add commercial pectin. The result is a delicious jelly with a color as brilliant as that of the fruit. This is a small batch recipe because currants can be both difficult to find and expensive unless you grow your own. But if you are blessed with an abundance of them, by all means, double the recipe. Wash the currants, but don't bother removing them from their stems. You'll get rid of the stems and seeds later with you strain their juice. Place the washed currants in a non-reactive pot (no cast iron unless it is enameled, and no aluminum). Add the water. Cook, stirring, over medium-low heat until the red currants have released all of their juice, about 20 minutes. While they are cooking, gently crush the fruit with a potato masher or the bottom of a wine bottle to help release the juice. Drain the red currants and their liquid overnight. You can do this through a dampened jelly bag, or by lining a colander with butter muslin or several layers of cheesecloth. Place whichever method you are using over a large bowl or pot (you can prop the colander up on long-handled wooden spoons placed over the bowl). Do not squeeze the jelly bag, muslin, or cheesecloth because that will result in a cloudy jelly. You want your final product to show off the jewel-like ruby red of the currants, right? The next morning, measure the red currant juice. You should have about 2 1/2 cups. Pour the measured juice into a large, non-reactive pot and add an equal amount of sugar. In other words, if you had 2 1/2 cups of juice you will add 2 1/2 cups of sugar. While the jars are sterilizing, bring the red currant juice and sugar to a boil over high heat, stirring constantly to dissolve the sugar. Continue to cook until the mixture reaches the gel point. If the jelly is ready before the jars are sterilized, simply remove the jelly from the heat until the jars are ready. Reheat the jelly just back to a simmer before filling the jars. Ladle the hot, liquid jelly into the sterilized jars leaving 1/4 to 1/2-inch headspace. Process in a boiling water bath for 5 minutes. Keep in mind that the jelly will still be hot and therefore liquid when it comes out of the boiling water bath. It will gel as it cools. Once cooled, use it on toast in the morning, as an addition to your cheese plate, or with roasted meats. Enjoy!